B&G Oilfield Services celebrates its 50th anniversary and relies on its decades of experience to make the most of the latest downturn. It’s a birthday party for B&G Oilfield Services, and a big one at that. With roots running deep in the Bakken Shale play, the company is in the midst of its 50th anniversary celebration. Now, however, the price that B&G can charge for its services is down right along with the price of oil. As a result, efforts to add efficiencies, reduce costs and find new routes to success have been ramped up. As a company with half a century of experience under its belt, it only makes sense that B&G and its people know a thing or two about the cyclical nature of the business and how to make the most of the good times and the bad. In fact, Baltes argues that the latest downturn has actually benefitted the company in a number of ways — and he makes a good case. New roads, infrastructure and plenty of added prospects were paved right along with the 2014 oil boom, and B&G has made a point of continuing to capitalize on those opportunities. It helps that Bertagnolli has a fantastic working relationship with the director of Job Service North Dakota, which allows him to keep a finger on the pulse of labor pool hiring trends. But a strong company culture has been a big boon to recruiting efforts, too. Yet another upside that has stemmed from the sluggish oil prices has been the decision to cross-train some of the company’s most talented employees in an effort to do more with less. Even though there are several separate company divisions, Baltes explains, when people start to work in other areas and get exposed to leadership in other divisions it begins to breed a culture of confidence. B&G features six main service divisions: well site maintenance and construction (roustabout division), pipeline construction and repair (pipeline division), pipeline inspection and condensate removal (pigging division), hydroexcavation services (hydrovac division), utility, well site locations and pipeline locating (line locating division), and horizontal directional drilling (boring division). In addition, a full human resources and safety team, a maintenance shop and a welding shop round out the company. It’s that breadth of offerings that helps set the business apart, according to Baltes. “We compete in a lot of those spaces, but there are very few companies up here that offer all of those,” he says. “It’s one-stop shopping, if you will.” And it’s a setup that bodes well during a stretch of time when customers are cutting costs wherever possible. In the past, there was such a supply and demand mismatch that all sorts of fly-by-night companies came in to take on the work, he explained. Once the market cooled, however, companies cut their budgets, became much more selective with their projects, and started scrutinizing every penny spent along the way. As upstream companies tightened budgets in order to make ends meet, that obviously rolled downstream to B&G, Baltes says, but he’s also quick to point out that with every challenge comes opportunity. The interesting dynamic is that in several cases entire company divisions sprouted out of nothing more than a single request from an existing customer. “I think it’s that approach that has really allowed us to continue to be successful and to grow and to diversify our customer base,” he says. When a company intends to install a pipeline, one of the very first steps involved is to provide notification so that everyone with an existing line along that proposed route — water, sewer, electric, fiber, gas, other oil pipelines, and so forth — will come out and mark their existing infrastructure that’s beneath the ground. “That’s also one of the service offerings that we happen to offer,” Baltes says. What began 15 years ago with one truck has since evolved into a full fleet of 14 Vactor HXX hydroexcavators. “All of our hydroexcavating machines are made by the same manufacturer,” Baltes says, and that’s a company philosophy that leads to a variety of benefits. Each of the operators can go out and work on any machine, all of the maintenance technicians can work on each piece of equipment with a sense of continuity, and the inventory of parts kept on hand can be reduced as well. Once that work has been completed, the horizontal directional drilling team can come in and pull new pipeline in underneath the existing utilities. To handle this work, B&G relies on five Vermeer bore rigs — three 60x90s and two 36x50s — as well as Cat 420 backhoes, Kenworth water trucks and Dodge 5500 crew trucks. B&G sees something special in its fleet of Vermeer directional drills, which includes three 60x90s and two 36x50s, and it doesn’t hurt that they are one of the company’s highest profit margin service offerings. 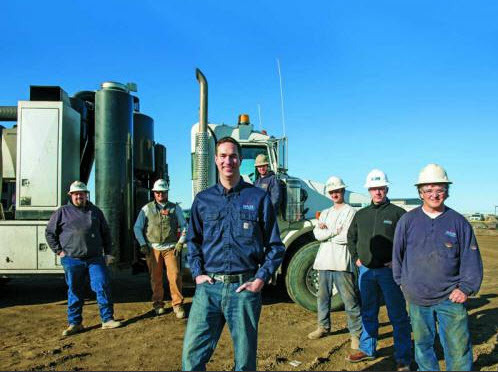 “Our horizontal directional drilling machines are just really cool pieces of equipment and I think essential for what we have going on out here,” says John Baltes, executive vice president of North Dakota operations.’re sophisticated pieces of equipment, and in order to be considered a foreman on one of the company’s HDD machines there’s a gradual progression through several different positions that employees need to go through. “So for the operators there’s a healthy appreciation for what the equipment can do,” he says. An interesting aspect of these machines is the relationship they create between the operator and the work that’s carried out, noted Baltes. A pigger puts something inside a pipeline and then grabs it at the other end but cannot see what’s going on in between. A utility locator marks lines that are beneath the ground but cannot physically touch them. “The HDD operators, on the other hand, receive immediate feedback on their work,” Baltes says.